Year 15 is a little milestone for us. For those who know Mike and I well we’ve been a couple for almost 23 years. OMG we’re old!! To make the really, really long story short, way back in the 80’s my brother’s childhood friend is one of Mike’s cousins who used to live up the hill from where we lived. They grew up together, were in the same Boy Scout troop, and became Eagle Scouts together. 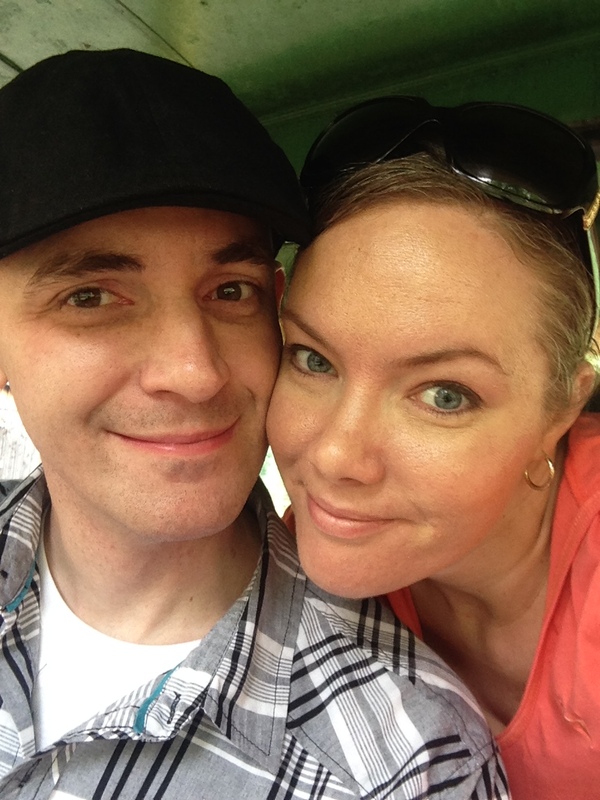 Then came along his wedding a couple hours from home, and that’s where our story began…. Some redhead dude with a bowl cut, pierced ear, wearing a green silk shirt and black tie (it was the early 90s, peeps!) showed up and BOOM! 6 months later we started dating. How did he get my phone number in the first place? I never asked, because I just knew one of his cousins gave it to him! A ring was in the glass of wine, and I cried uncontrollably for 5 minutes until a tiny “Yes” came out of my mouth. I’ve been a fan of wine ever since. Fast-forward again 3 years later, on this day in 2002, we made it official. We already felt like an old married couple before we became an old married couple! 15 years and 1 kid and 2 cats later, here we are, still in the same town in the same house, but soon that’ll change too. We’ll start our search for a new home soon, but one thing may be different…it MIGHT be in the same town, but we will still be close to family, friends and the band. 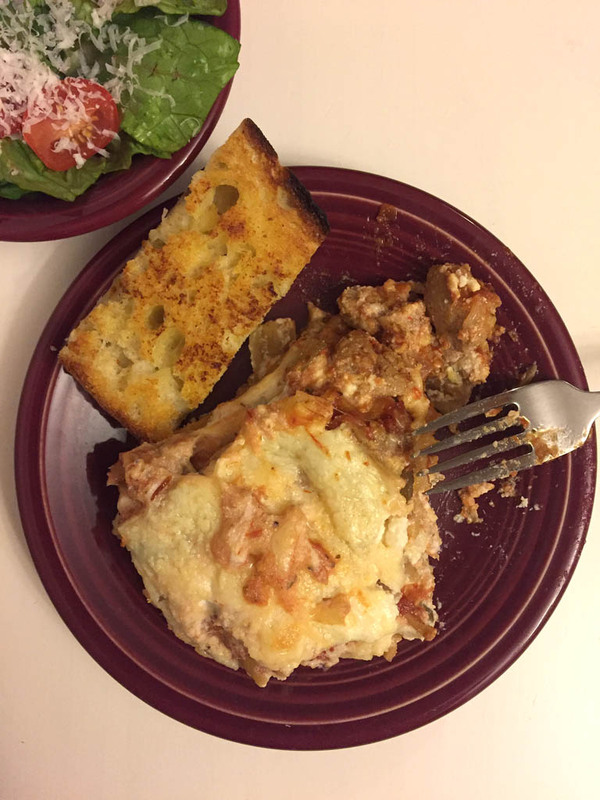 Now about this lasagna, it’s Mike’s favorite meal, and mine too, because it’s so delicious and so easy to make. It’s the meal I made on the day he proposed to me. It’s the meal my mother made a good bit, but I changed things up to Mike’s specifications: absolutely no cottage cheese!! He prefers ricotta cheese. Mom always made lasagna with cottage cheese in it, and growing up I always saw it as a normal ingredient you put in lasagna. As I got older I learned that the reason why Mom put cottage cheese in her lasagna and never ricotta is simply because she was trying to save money. But if you want to go the cottage cheese route, it’s just as yummy! This recipe is not written down on an index card; I had to consult my memory bank for this one. It comes from the many many years of making it and watching my mom make it, and as time goes by, it’s become one of Mike’s favorite meals besides steak and German food. It’s a super-simple dish, and along with a side salad and garlic bread, it’ll fill your belly with satisfaction. It’s a meal full of fond memories of our lives together. So here’s to my husband (raising a glass of red wine). The skater boy, the artist, the horror punk rocker, lover of hockey and all things Halloween. He not only made the past 20+ years being his girlfriend and wife awesome, but the past 4 years seeing him as a daddy, he’s the best, fun-loving father a daughter could ever have. I love you, Mike, and here’s to another 15+ more years of lasagna! 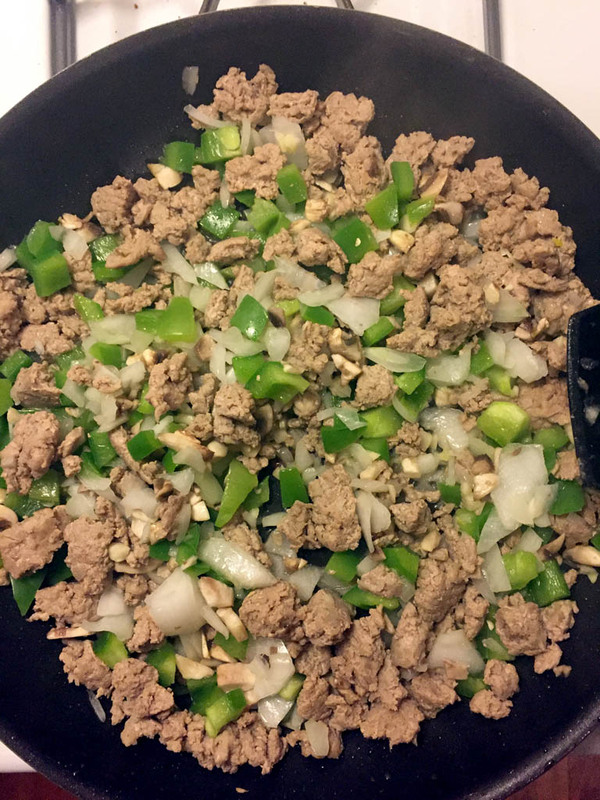 • Drizzle a little bit of olive oil onto the bottom of a large skillet. Break up and brown the ground beef; cook until meat is no longer pink. Drain oil if needed. Add garlic, vegetables, sprinkle a little bit of salt to enhance the flavors, and cook on low for about 5-10 minutes. • Meanwhile in a medium saucepan, pour in the crushed tomatoes and stir in the sugar. The sugar is to lessen the bitter taste of the sauce. Add in the Italian seasoning, cover, and cook on low heat until heated through. 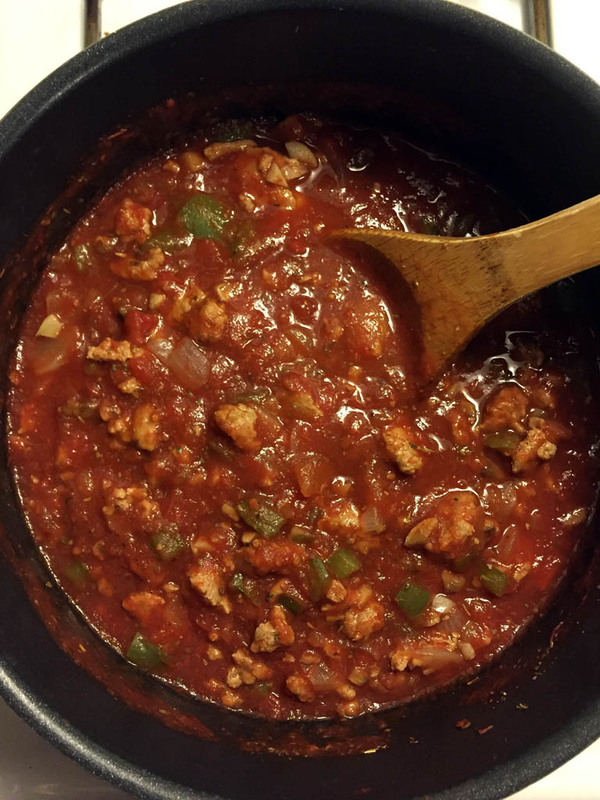 Then mix in the ground beef with your sauce. 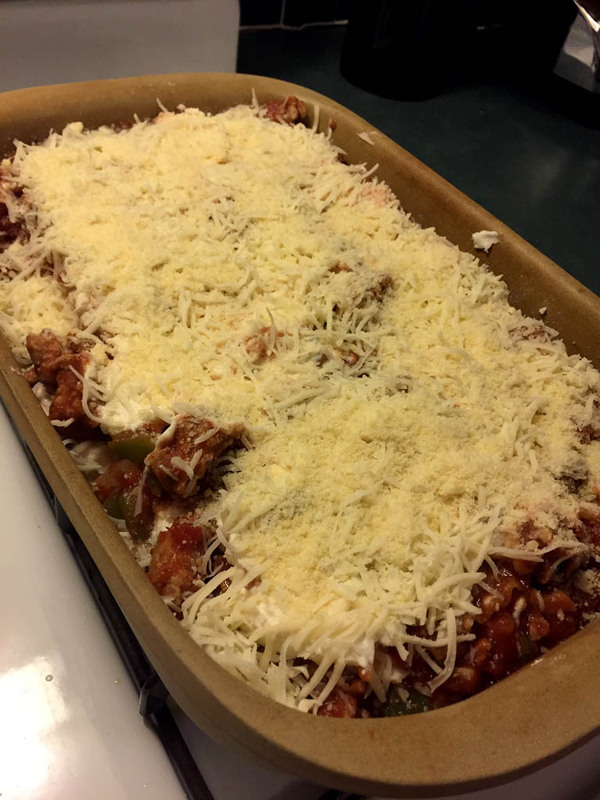 • To prep the lasagna: In a 9×13 baking dish, drizzle a little bit of sauce on the bottom of the dish and then add a layer of uncooked lasagna noodles. I don’t layer the noodles; I lay three noodles side-by-side, and then lay part of one across one end of the dish to fill the gap. Next pour a little bit of sauce over top of the noodles; spread sauce evenly. Next, spread a little bit of the ricotta cheese over top the sauce, then sprinkle mozzarella cheese, then sprinkle some Parmesan. Start the second layer by placing the noodles over top the cheese; repeat layers until you no longer have any more cheese (Be sure to save some mozzarella for the very top of your lasagna!). • Cover dish with aluminum foil and bake in a preheated 350-degree oven for 1 hour until the noodles are softened and cheese is melted. 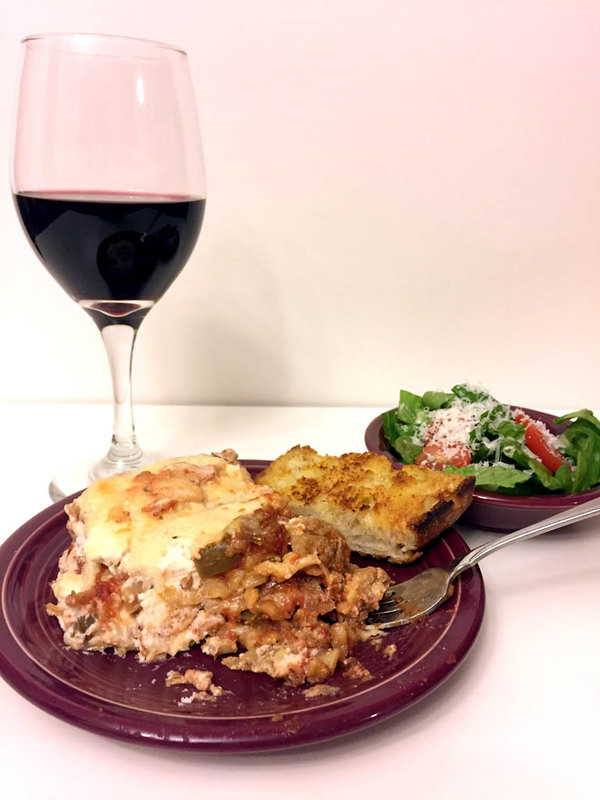 • Let lasagna cool down and stop bubbling for a few minutes before serving. *If you don’t have Italian seasoning, you can create your own combination of herbs. I’d use oregano, basil, parsley, and thyme, and mix them together. 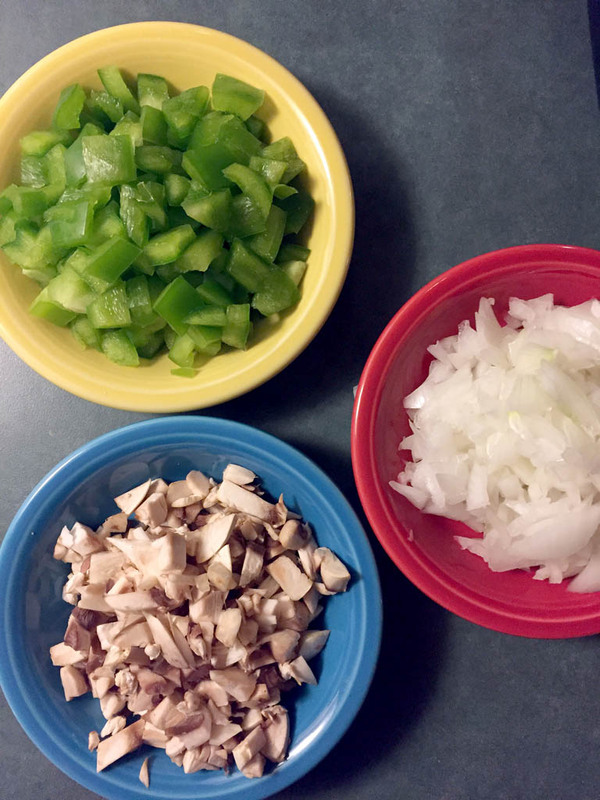 Make enough to create a tablespoon, or more if you prefer.